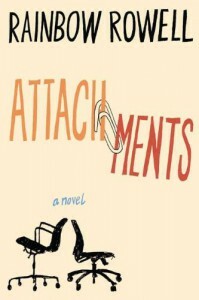 We hope you have enjoyed our presentation of Attachments: A Novel by Rainbow Rowell says the audiobook reader at the end of the book. No. No, I really haven't. Thank you, though. Hello, I am the Lone Dissenter. See, here's my problem: This book runs parallel to my back-then life; the characters are my age, I lived through Y2K in a very similar fashion, I've done the e-mailing daily conversations to work friends in the late 90's, I've both e-stalked someone and given them all the attributes I wanted them to have and then fallen in love with the creature I created in my head and I've had it done to me (which resulted in real, actual stalking and was scary as hell), I've spent time in Nebraska (waaay too much time), I've stopped my life to live for someone else, someone who didn't love me like I loved him...everything in this story was incredibly relatable when seen through the goggles of my own history. I think maybe I'd have liked this had it actually been written in 2000 and had I read it then. Maybe I would have found it sweet and not unhealthy. Had this come out around the same time as Bridget Jones, I'm sure I'd have gobbled it up as a read-alike and been completely delighted. It's too late for me, though. 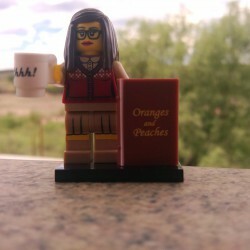 It's not too late for all of you who have not become cynical, bitter curmudgeons, for those of you who still think someone counter-stalking their stalker is romantic, for those of you who don't need their characters to have self-worth or to be strong or to not be unknowingly beautiful. For those of you who wonder why Beth and Jennifer don't have any other friends. It didn't work out that way and I was left disappointed. This wasn't the story for me. It was and is, however, a wonderful story for many other readers and I appreciate that.